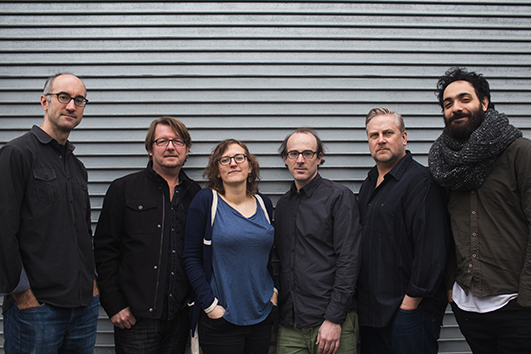 Roulette welcomes Brooklyn-based clarinetist, saxophonist, and composer Ken Thomson for an evening of music featuring the New York premieres of “Ripple” and “Pall”, followed by a performance by Thomson’s ensemble project, Sextet, as they celebrate their latest album, out now on New Focus Recordings. Thomson is a staple within NYC’s contemporary music and jazz communities, known for his playing with the Bang on a Can All-Stars, and composing and playing with the bands Slow/Fast and Gutbucket. He has written music for the JACK Quartet, Ashley Bathgate, American Composers Orchestra, and others. Thomson is known for a unique voice that blends a variety of styles, with the Chicago Reader exclaiming that “few musicians travel as assuredly and meaningfully between jazz and new music as saxophonist Ken Thomson.” Guided by a desire to create music in which composition and improvisation are equally important and codependent, this project is the latest in a series of recordings the composer has made unifying these traditions. Most clearly indicating Thomson’s creative road to Sextet are the two albums with his cross-genre ensemble Slow/Fast. The most recent of these, Settle, was praised by the New York Times for its “intricate long-form compositions,” and garnered a five-star review in All About Jazz. For Sextet, The Bang on a Can All-Star reedist expands his ensemble to include alto and tenor saxophones (Thomson and Anna Webber), trumpet (Russ Johnson) and trombone (Alan Ferber, and in this performance, Nick Finzer), and dropped the chordal instrument, leaving bass (Adam Armstrong) and drums (Daniel Dor). With four horns, the palette is bigger, broader, and more dynamic. Ken Thomson is a staple of New York City’s contemporary music and jazz communities and is widely regarded for his ability to blend a rich variety of influences and styles into his own musical language while maintaining a voice unmistakably his own. Embracing the combination of complexity in harmony, rhythm, and form while adding a punk-rock aesthetic, Thomson has carved out a unique corner in today’s multifaceted musical world. As a performer-composer bridging jazz and contemporary music, Thomson has released two albums with his group Slow/Fast. The most recent of these, Settle, was praised by the New York Times for its “intricate long-form compositions,” and garnered a five-star review in All About Jazz. The Chicago Reader wrote, “Few musicians travel as assuredly and meaningfully between jazz and new music…. Thomson’s pieces breathe and emanate an infectious energy, with every wend and wind hurtling the music forward rather than showing off the band’s chops.” He released an album of his compositions for the heralded JACK Quartet, entitled Thaw, on Cantaloupe Music. The record was called the #1 Classical CD of 2013 by Rhapsody, and was among NPR’s “10 Songs Public Radio Can’t Stop Playing.” His 2016 release, Restless, features two major works for cello and piano performed by Ashley Bathgate and Karl Larson. It garnered a 7.9 Pitchfork review and received “Top of 2016” accolades from writers Seth Colter Walls, Steve Smith (Log Journal) and AnEarful, which wrote, “No album in 2016 in any genre did more with less than Restless, featuring two huge-sounding chamber works composed by Thomson.” Thomson plays clarinet for the Bang on a Can All-Stars, one of the world’s preeminent new music ensembles. He is the musical director for the Asphalt Orchestra – a 12-piece next- generation avant-garde marching band, called “cooly brilliant, infectious” and “top notch players” by the New York Times. He plays saxophone and is one of the four composers in the punk/jazz band Gutbucket, with whom he has toured internationally to 20 countries and 32 states over 17 years, and released six albums and a DVD for Knitting Factory, Enja, NRW, Cantaloupe and Cuneiform Records. He is on faculty at the Bang on a Can Summer Music Festival. As a composer, Thomson has been commissioned by the American Composers Orchestra, Bang on a Can, the True/False Film Festival, Doug Perkins, Mariel Roberts, and others; and has received awards from New Music USA, ASCAP, Copland Fund, and Meet the Composer. Thomson has performed extensively across the US and Europe at major jazz festivals including Jazz a Vienne, San Sebastian Jazz Festival, Warsaw Summer Jazz Days; and the Saalfelden, London, Copenhagen, Rotterdam and Belgrade Jazz Festivals. He has recently been the subject of profile features in Downbeat and NewMusicBox. He is a Selmer Paris and Conn- Selmer Artist, and a D’Addario Reeds artist. Praised for her “sensitivity and top shelf artistry” (Cleveland.com), violinist Katie Hyun has made solo appearances with the Houston Symphony, the Dallas Chamber Orchestra, the Philadelphia Orchestra, and the Columbia Festival Orchestra, among others. Additional highlights include concerto performances with the Busan Sinfonietta and Incheon Philharmonic in South Korea. Festival appearances include the Chelsea Music Festival in New York, Habitat4Music in Vermont, Bravo! Vail in Colorado, Chamber Music Northwest Winter Festival in Portland, Bright Sheng’s “Intimacy of Creativity” in Hong Kong, and ‘New York in Chuncheon’ and the Busan Chamber Music Festival, both in South Korea. Katie is the founder and director of Quodlibet Ensemble, a small chamber orchestra that made its debut in 2008 to great acclaim and has since released its debut album in the spring of 2014. Katie was also a founding member of the award winning Amphion String Quartet, which was a winner of Concert Artists’ Guild Management in 2011, and was on the roster of The Chamber Music Society of Lincoln Center’s CMS Two Program for the 2013-’16 duration. The Amphion String Quartet’s debut CD was also featured on the New York Times’ ‘Best of 2015.’ Additionally, the quartet has also performed in Carnegie Hall, Alice Tully Hall, Chamber Music Northwest in Portland, La Jolla Music Festival. On Baroque violin, Katie has recorded with and frequently appears with Trinity Baroque Orchestra, the Sebastians, and New York Baroque Incorporated. Violinist Lena Vidulich is an adventurous and multi-faceted performer based in New York City. A tireless advocate for new music, she is also able to move fluidly between the worlds of orchestral music, rock, improvisation, and musical theater. Lena is the violist of earspace, a Raleigh-based ensemble creating multi-sensory performances, and co-artistic director of Amalgama, a septet dedicated to the synthesis of improvisation and contemporary classical music. Lena holds a Bachelor of Music in violin performance from Northwestern University. Her education also included studies at the Conservatoire national supérieur de musique de Paris and Université de Paris 8 – Vincennes-St Denis. Lena recently received her master’s degree in contemporary violin performance at the Manhattan School of Music. She is currently pursuing a Teacher’s Certification at the Riverside Initiative for the Alexander Technique, where she studies with Nanette Walsh, Lori Schiff, and Ariel Carson. Violist Dr. Wendy Richman, hailed by The New York Times and The Washington Post for her “absorbing,” “fresh and idiomatic” performances with “a brawny vitality,” has appeared as a soloist and chamber musician across the U.S. and Europe. Upon hearing her interpretation of Berio’s Sequenza VI, TheBaltimore Sun commented that she made “something at once dramatic and poetic out of the aggressive tremolo-like motif of the piece.” The particular praise Wendy has garnered for her interpretations of new music has led her to collaborate closely with a wide range of composers and to such performances as the American premieres of Kaija Saariaho’s Vent Nocturne and Roberto Sierra’s Viola Concerto. Wendy’s most recent endeavor, Vox/Viola, involves commissions from 25 young composers to write pieces for her singing & playing simultaneously, loosely inspired by Giacinto Scelsi’s Manto III. Wendy is a founding member of the International Contemporary Ensemble (ICE), a Brooklyn-based collective of young musicians dedicated to reshaping the way music is heard and experienced in the United States and around the world. She teaches at New York University’s Steinhardt School of Music and Performing Arts (NYU Steinhardt). Jeffrey Zeigler is one of the most versatile cellists of our time. Acclaimed for his independent streak, he has commissioned over three dozen works, and is admired as a potent collaborator and unique improviser. Zeigler has been described as “fiery”, and a player who performs “with unforced simplicity and beauty of tone” by the New York Times. Jeffrey Zeigler was the cellist of the internationally renowned Kronos Quartet for eight seasons. During his tenure, Zeigler had the opportunity to collaborate with a wide range of luminaries from John Adams to Noam Chomsky, from Damon Albarn (Gorillaz) to Trimpin and from Henryk Gorecki and Steve Reich to Tom Waits. Since moving on from Kronos, Zeigler has enjoyed a wonderfully multifaceted career which has led to collaborations from Yo-Yo Ma and Laurie Anderson to Hauschka and Roomful of Teeth, from Philip Glass and Foday Musa Suso to John Corigliano and Vijay Iyer, from Tanya Tagaq and Terry Riley to Vladimir Feltsman and John Zorn. Zeigler has also collaborated with members of the Eroica Trio and the Cleveland and St. Lawrence Quartets. Anna Webber is a New York-based flutist, saxophonist, and composer whose interests and work live the overlap between avant-garde jazz and new classical music. With her Simple Trio, featuring drummer John Hollenbeck and pianist Matt Mitchell, she has released two critically acclaimed albums on Skirl Records: Binary (2016) and SIMPLE (2014). Webber’s other projects include her septet Percussive Mechanics, Jagged Spheres with Devin Gray and Elias Stemeseder, and The Hero of Warchester with Nathaniel Morgan and Liz Kosack. She has performed and/or recorded with bands led by Dan Weiss, Jen Shyu, Matt Mitchell, Ohad Talmor, John Hollenbeck, Ches Smith, Hank Roberts, Harris Eisenstadt, Adam Hopkins, and Erik Hove. Webber is a 2018 Guggenheim Fellow. She has additionally been awarded grants from the Shifting Foundation (2015) and residencies from the MacDowell Colony (2017), the Millay Colony for the Arts (2015), and the Brush Creek Foundation for the Arts (2014). In 2014 she won the BMI Foundation Charlie Parker Composition Prize as a member of the BMI Jazz Composers’ Workshop. Webber is originally from British Columbia. Russ Johnson, trumpet, is a recent Midwest transplant after spending 23 years as an important member of New York City’s jazz community. He has 7 recordings as a leader or co-leader and performed on more than 75 recordings as a sideman. Russ has worked alongside many of the legendary figures in jazz including Lee Konitz, Steve Swallow, Bill Frisell, and Joe Lovano. In addition, he has recorded and/or performed with a long list of the most prominent musicians currently on the international jazz scene,including Myra Melford, Ken Vandermark, and Tony Malaby. Russ has performed in more than 40 countries across the globe. His groups have recently performed at the Chicago, Winter Jazz Fest (NYC) Hyde Park, (Chicago) and Bergamo, (Italy) jazz festivals. His most recent recordings, Meeting Point (Relay Recordings) and Still Out To Lunch! (Enja Records) received 4 1/2 & 4 stars respectively from Down Beat Magazine and appeared on many “Best Recordings of 2014/5” lists including Down Beat, the Chicago Tribune, Chicago Reader, NYC Jazz Record and Magnet magazine. An award-winning composer, arranger, producer, and trombonist, Nick Finzer is bringing the joy and power of Jazz to both traditional fans and the most modern 21st century audiences. He’s on a mission to be a passionate voice defining the sound of Jazz in this age while also bringing street cred to the trombone with a bold, tight sound. Listeners will enjoy the wide emotional range of Finzer’s brilliant original compositions and arrangements on his latest album, No Arrival (Posi-Tone 2018). The album finds Finzer taking things forward while simultaneously being drawing back to the music that got him to this point in time, with a mix of influences and a unified concept. Famed trombonist and mentor Wycliffe Gordon called Finzer “a new voice [in] the pantheon of upcoming trombone greats in the making” and added “Nick’s CD is a glowing example of things to come.” When away from NYC, Finzer can be found touring the globe not only with his own projects, but as part of Anat Cohen’s Tentet, teaching workshops and masterclasses, and appearing with YouTube sensation Postmodern Jukebox. Finzer has performed at top jazz clubs, festivals and concert halls with Wynton Marsalis’ Jazz at Lincoln Center Orchestra, the Newport Jazz Festival with Anat Cohen, Lucas Pino’s No Net Nonet, Ryan Truesdell’s Gil Evans Project, Bob Stewart’s Double Quartet, Frank Wess, Terrell Stafford, Lewis Nash, the Tommy Dorsey Orchestra, Walt Weiskopf, Slide Hampton, Frank Kimbrough, Carl Allen, Steve Turre and many more. Adam Armstrong relocated from Australia to New York in 2000 with the assistance of an Australian Arts Council professional development grant. In his thirty five year career, Adam has had the opportunity to perform with many notable artists, including jazz greats, Kenny Kirkland, Kenny Wheeler, Maria Schneider and Billy Cobham. Adam can be heard regularly in the clubs of New York City, playing with groups lead by a variety of artists, including Ken Thomson, Richard X Bennett, Eric Person, Christian Finger and KJ Denhert. Adam has toured through 34 countries, performing in clubs and at major festivals in Europe, Asia, Australia and the Americas. He appears on over 80 albums, including two ARIA (Australian Recording Industry Award) winners, has played on the soundtracks of feature films, TV shows and theatre productions, and has given master classes and workshops at institutions around the world.